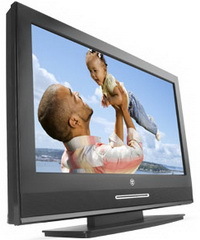 (without stand or speakers) 39.0" x 26.2" x 6.9"
Combine the brilliance of an eye popping 1080p display with the impressive convenience of an integrated DVD player and you have the new VK-40F580D from Westinghouse Digital. This versatile 40” 1080p LCD HDTV features an integrated front slot load DVD player, 2 HDMI™ inputs and preset and custom video modes for an exceptional viewing experience. Additional features include Pixel Direct™ technology that delivers DVD video to the screen using a direct path (the shortest path possible) and the least amount of signal processing and SpineDesign™ featuring side connectors for easy accessibility.